As a photographer attempting to communicate personal experiences and my, at least I think, special view of life and the world, occasionally I have thoughts that if I wanted to connect en mass I should have been into music! When I look at what music does to I see participants who will slap, tap, hum, whistle, laugh, tear up and even cry. Music sure beats the visual arts hands down as a way of creating a connected audience response. But an exhibition of photographs at the Caboolture Regional Art Gallery, just a few kilometres north of Brisbane, may just win some points back for the visual artist. 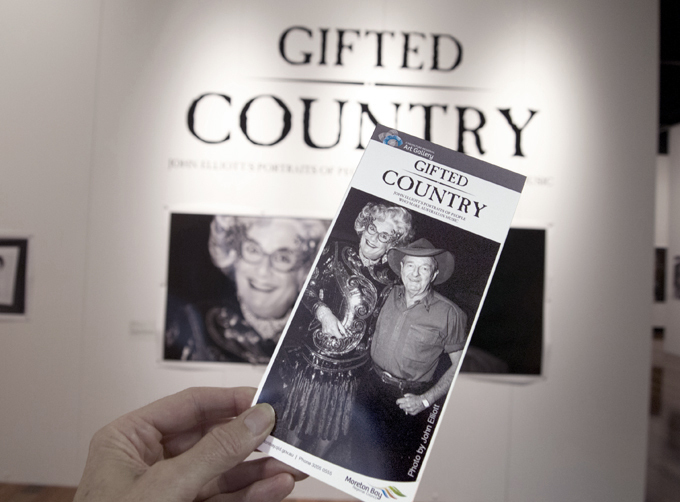 Gifted Country is a photographic exhibition of the doyens of the world of country and western music by Toowoomba photographer John Elliott. As a follower of the music industry for over 30 years Elliott has amassed a collection of the latest top hits and the golden oldies. 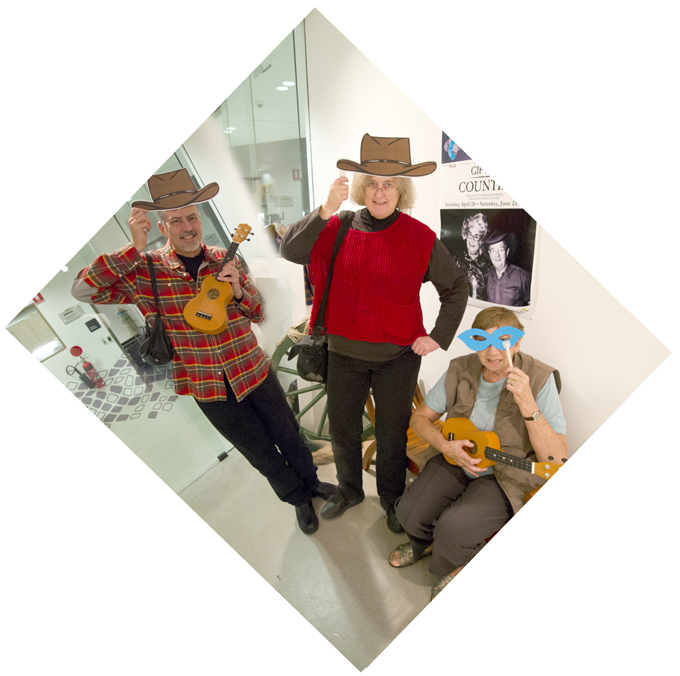 On the walls of the gallery the faces of C&W music stare out at the viewer — frozen and mute. Elliott has reduced them to an eye-only sensory experience. The only sounds permeating the space are the shuffle of footsteps of other gallery viewers and the muffled voices of local community members returning books to the library next door. Before you get the feeling that the show is a little underwhelming there are other things to consider. Firstly the music and photography industry do share some similarities. Apart from practitioners at the most visible pinnacle of the discipline, those who make the sound and the image – the photographer behind the camera, the songwriter, the muso behind the lead singer and the mixer at the sound deck — are faceless. Only the products of their creative efforts are known to us. Okay, we can all recognise a Slim Dusty, Casey Chambers and Keith Urban from across the room. And that is perhaps because photographers like Elliott have made their image, apart from their music, famous. A reflective Jimmy Little leaning on a guitar neck (the one Little’s family selected as the ‘hero’ image for his recent funeral service), Lee Kernaghan stridently stands sky-pointing before a dramatic theatrically lit stage and a wide-eyed Chad Morgan’s face pokes out from his trade-mark safety-pinned hat. Once you’ve cherry-picked a few of the icons you are left with portraits of haggard faced, guitar holding middle-aged men, sweet smiling young girls and longhaired youths that crowd the rectangle photo frame. What Elliott’s efforts bring to us is the human face of the extended country and western industry. These faces could be those of the waitress, the farm hand, the rodeo queen and the Big Mack truck mechanic. To help make the connection for the viewer Elliott pairs the portrait with the carefully chosen words of a biography that makes visible the musical provenance that we may share with the subject. Additionally a website links to interviews, commentaries and music to enliven the interest of those with a passion for C&W music. What is remarkable is that over the years John Elliott has worked to amass this body of work. And this is not his sole interest — there are landscapes, urban vistas, other portraits and the personal and intimate moments of life. But this body of work has a quality and magnitude that sets it aside from the usual music documentary record. Doug Spowart May 26, 2012. « What is this thing called art photography?